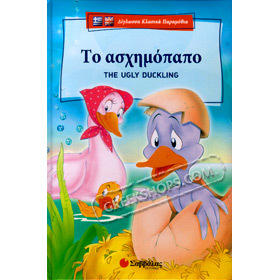 The classic story of the The Ugly Duckling / To Ashimopapo in Greek w/ the English translation. Each page features colourful illustrations, large Greek Fonts and below the paragraph is translated into English. Discover the magical world of fairy tales and improve your English by reading the story of young homely duckling who is picked on by the other animals in the barnyard until one day when he matures into a graceful swan. Εξασκήστε τα αγγλικά σας διαβάζοντας την τρυφερή ιστορία του ασχημόπαπου, από το δύσκολο ξεκίνημα της ζωής του, μέχρι τη μέρα που ανακάλυψε ότι μεγαλώνοντας είχε μεταμορφωθεί σε έναν πανέμορφο κύκνο.